Is There a Low Cost Way of Getting My Horse to Gain Some Weight? 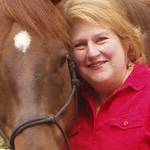 Is your horse losing weight during cold weather? Don't be fooled by thick winter haircoat. Q. My horse gets really thin in the winter. Is there a low cost way of getting her to gain some weight? Weight supplements are just too expensive." A. Horses that have a high metabolic rate tend to lose weight in cold weather just trying to maintain a normal body temperature. Don’t be fooled by a thick winter hair coat – if your horse does not have enough flesh, he may need to be blanketed during weather extremes. Check him daily for areas that may be rubbing and make certain he is not sweating under the blanket. Remove it on warmer, sunny days. 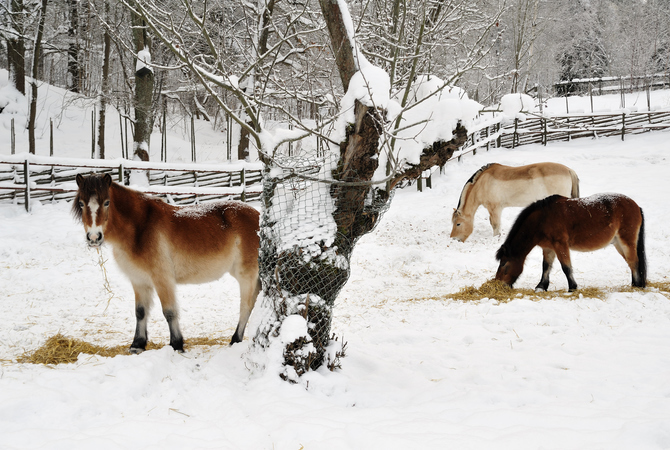 Some horses require additional calories to maintain weight during the winter months. Forage (fresh pasture or hay) should be the staple of the diet—always available, all day and all night. 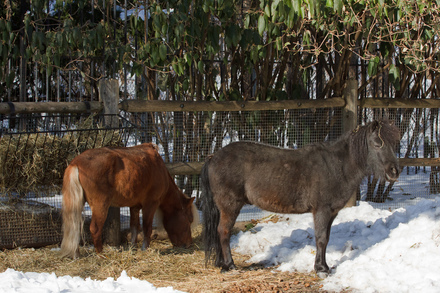 Offer hay free-choice, allowing your horse to graze at will. Add alfalfa as an additional forage source. Alfalfa boosts the protein quality of the entire diet, enhancing body tissue repair and production. It can be fed as hay, cubes, or pellets (be sure to moisten the cubes or pellets to prevent choke). Approximately 30 to 40 percent of the total hay ration can be fed as alfalfa but never more than 50% (to prevent enteroliths). Concentrated feeds add calories. Instead of reaching for oats or sweet feed, choose a product that offers less starch and more fat (at least 8%). Sweet and/or starchy feeds can cause excessive acid production and can lead to metabolic problems as your horse ages. You can also feed beet pulp or alfalfa pellets (they should both be moistened), along with some fatty substance such as rice bran or ground flax (best source since it provides valuable omega 3s) at a rate of ½ cup per 400 lbs of body weight. Extra oil can be fed – choose rice bran or canola oils. Soybean or corn oils are too high in omega 6s which can lead to inflammation. When adding oil, start with only one tablespoon per meal. You can slowly build up to one cup per day for the maintenance horse. Hindgut microbes need to be plentiful to digest fiber. Their numbers can diminish due to illness, stress, over-consumption of cereal grains, stall confinement, and antibiotic therapy (which kills beneficial as well as harmful bacteria). Supplementing a pre/probiotic is often a good approach to assist with weight gain. A prebiotic is different than a probiotic because it does not contain any live microbes. Instead, a prebiotic feeds the existing bacterial flora in the hind gut, making them healthier and better able to digest forage. The result is weight gain, since the horse can get more calories from fiber found in hay and pasture. Prebiotics are listed as “fermentation products” and are derived when bacteria ferment various carbohydrate sources. When shopping for a probiotic, pay attention the number of colony forming units (CFUs). This tells you the number of living microorganisms. There should be at least one billion (denoted by 109) CFUs per organism. Cultures of live yeast organisms are also used as probiotics. By adding fat, extra protein, pre/probiotics, and keeping your horse warm, you’ll allow him to maintain a healthy body condition. When making changes to the diet, remember to make them slowly, giving the hindgut bacteria a chance to adjust.